I just finished reading a book called, Call of a Coward, by Marcia Moston. She was one that God called out of her comfortable life and asked her and her family to move to Guatemala to be missionaries. I’ve always admired people who were willing to put their lives aside and follow Jesus to destinations unknown, trusting that He would take care of them. It is always exciting to hear and see what God is doing in others’ lives and be reminded that we definitely serve something way bigger than ourselves when we call ourselves Christians. Even though I’ve always been fascinated with missionaries and their commitment to serve God with everything they have and do, I’ve never been called to do it myself. On my daughter’s 16th birthday though, she and I boarded a jet with 3 others headed for India to serve for a couple of weeks on a mission trip—this being the closest I’ve ever been to being a missionary. I remember my mom taking us to the airport and as we were boarding the plane, she was saying, “You don’t have to go. I can take you back home right now if you’d like.” She was afraid for us to be going so far into lands unknown and was fearful for our safe return. I knew though, that I needed to go. I wasn’t going because I wanted to take time off without pay and live in the land of no toilet paper and sunshine for 2 weeks. I was, in fact, going because I felt that God had put a call on my life to be there for that time. I have to say, as we stepped off the plane onto foreign ground, I questioned myself. Is this really what I should’ve done? Should I have boarded this plane going half-way around the world with my teenage daughter? But the wonderful thing about serving a powerful God is when you know that He is leading, the fear falls away and the joy begins in the obedience of following Him. I would much rather be where He wants me to be in worlds unknown vs. being in the safety of my own home in disobedience when He had called me elsewhere. There’s an old song that sings, “Where you lead me I will follow, where you lead me I will follow, I’ll go with you, with you all the way! This is what I want my life-song to be. Lord, I will go with you wherever you lead me…all the way. When you say something like this to God though, you have to be ready to be stretched. God isn’t a God of complacency. He doesn’t allow anyone to coast through Christianity. In fact, He’s not satisfied until you are refined through the fires. He knows that in order for you to be the best you can be and learn to be strong in your faith, sitting on the couch watching TV and eating bon-bons isn’t going to help you grow. Well at least not in the spiritual realm! It probably will help you grow in physical ways for sure! LOL! One year when I was a single mom, my daughter was having another birthday and my friend’s son was too, just within a few days of each other. My friend and I were trying to think of something different we could do to make their birthdays memorable. I think we got the prize that year as we loaded them into the car and took off for a destination unknown birthday trip. They were both teenagers at the time and as we drove, you could start feeling their fear of the unknown as they already thought we moms had two heads and were crazy anyway! I’m sure they were wondering where in the heck we were going as after about an hour and a half of driving, we began our trek out into remote areas where there seemed to be nothing but grass, trees and winding roads that would make even the strong sick after a while. My friend’s son was saying are you going to drop us off out here in the middle of nowhere and leave us or something? They were both becoming so agitated by not knowing, we decided to go ahead and tell them the truth so they would calm down. We told them we were going to a place where we could pet tigers and lions. I was sure with the animal lovers that they both were, they were going to love the idea! It was too funny though. Even though we were telling the truth, they didn’t believe us! They were even more upset then as they really wanted to know where they were going. They just knew we were lying to them with the lion and tiger story. It was priceless to see their faces as we pulled into the reserve and they saw the lions and tigers everywhere around them. I think they thought we had literally lost our minds. It is kind of scary when your teenage kids are thinking what we are thinking about doing might be dangerous when the two of us moms are saying, “Come on! It’s going to be fun! Let’s do it!” That day, we did actually pet lions and tigers. 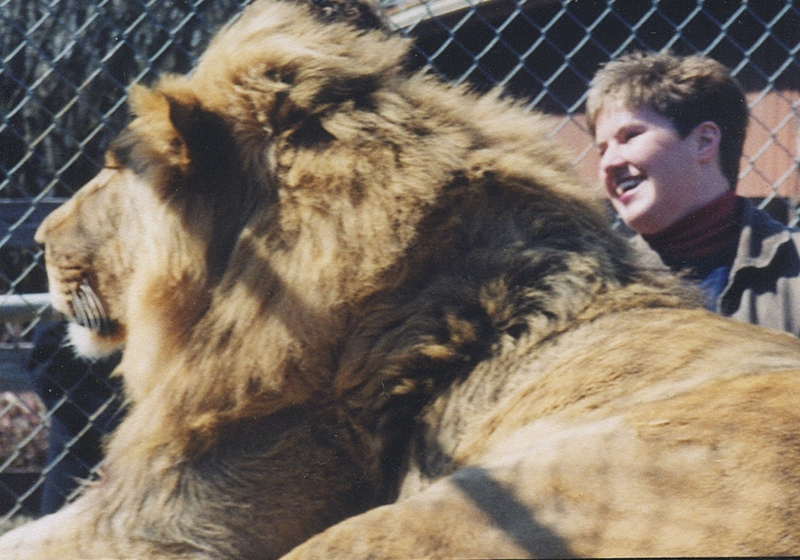 I thought it was so cool to be standing there beside this huge lion and petting him. At first when I began to pet him, he flinched as though he had a fly on his back or something and scared me to death! I then realized the huge difference between him and me. I may think I am strong and brave, but beside him, I was reduced to fly level. The lady who was telling me how to approach him and pet him, told me I needed to get through his large main so that he could actually feel my hand vs. thinking of me as an annoyance. As I pressed through the deep fur, I found myself actually watching this lion find enjoyment from the massage I was giving him once he could actually feel it! Imagine that! After leaving the reserve that day, we were all high on having stepped out of our comfort zones and done something very few can say they ever did. We had blazed new territories that day and it felt good. expects me to use my voice to share. If you’ve ever tried to tell someone about your faith, you know, it can be really scary at times. It’s not scary because of the message, but more so for the fear of rejection when we do. There have been other times, He’s asked me to go to a neighborhood of high crime and pass out hotdogs and befriend those living in the area. He even asked me to go speak to crowds of people several times about hot topics like abortion. Talk about scary! stepping out to do what He’s asked us to do. No longer do we have to live in complacency and boredom when we have the Creator of the universe guiding us to destinations unknown! Knowing that you are in God’s will each day fills the voids that you’ve been feeling with excitement and joy when you know you’re fulfilling your purpose here on earth, even when we’re just doing the everyday things. We can no longer be content with just brushing the surface of who God is; rather, we need to press in and get to know the heart of Him. It takes courage to step aside and allow God to guide and direct rather than you being in control of everything. However, once you do get beyond the surface, you realize that it is not nearly as scary as you thought it might be. Rather, it is comforting to know that this One that invites you to Him will also guard and protect you throughout your walk with Him. You no longer need to be afraid… you just need to trust. Lord, I pray for those reading this today. I ask that You will give them adventures that will stretch them and mold them into the person You created them to be. You may not be asking big things of them; rather, You know exactly what they need to grow. Help them to not be afraid, but to be brave. Show them Your great power and teach them that even in their times of fear, You are strong and courageous—standing in for them in their time of need. If God is doing something big in your life or has even asked you to do something small that you wouldn’t have done before you knew Him, send me a note on the blog for others to see or privately to justtryingtobeablessing@gmail.com and let me know. It is exciting to see God at work and encouraging for those still afraid to see others stepping out and being blessed! It would also be encouraging for me to know this helped someone to be courageous in their walk with Christ!